Synopsis of "I was wrong." It is difficult for most of us to admit that we are wrong in the minute day-to-day failings in our lives. Can you imagine coming to a point in your life where you realize the very public platform that you've stood on for most of your life is egregiously flawed? In "I was wrong." 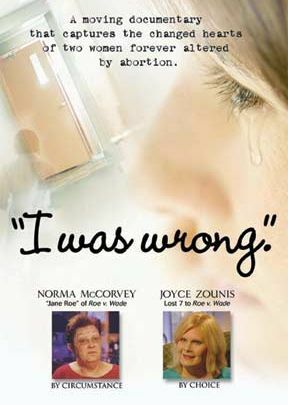 this truth is captured in the life experiences and changed hearts of two women forever altered by abortion; Norma McCorvey, former 'Jane Roe' of Roe v. Wade, icon of choice and Joyce Zounis, seven-time consumer of choice.